Airwheel Granville in the current electric unicycle market in a very big market share a brand, business establishment time is not really a very short, but the speed of development did, and a lot of people off the Chin from Ireland at the door officially arrived unicycle market day, destined to this will be an immortal legend. A team of geeks own innovative spirit, a team with years of research on intelligent means of transport, excellent supplier, supply chain management, it's hard not to create a good smart car. 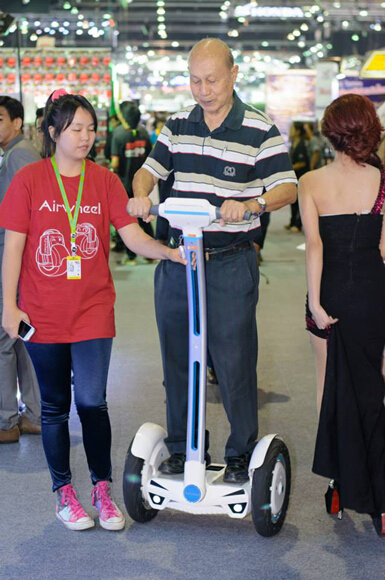 Airwheel Granville 2014 hottest models, Airwheel via S3 electric balance truck , once the market immediately to get market recognition. This paragraph continued see love, Granville made car followed of smart car, not only shape beautiful, featured has currently global both thin and firm of optimal mass material making, in main accessories aspects is, carrying global first-class smart chip and top smart chip of love, Granville S3 scooter, not only has 65 km super strong range capacity, in motor horsepower aspects also hosted has smart car of spirit, wants to go on go, free. As if Lamborghini headlights on the front, as though warning passers-by and cars: leave me alone, I'm tough. Side, no extra lines S3, almost in one fell swoop, harmony flow smoothly. Dapper lightweight body weighing only 22.4, should be bigger than a bicycle light. You think it can't and wheelbarrow in your trunk? a removable Assembly S3 electric self-balancing scooter, can put no pressure on your bike in the trunk. In S3 zhiwai, love, Granville also has many classic of unicycle models, like X3, and X8, and Q1, and Q3, and Q5,, these models same of features is in actual driving in the performance good, in love, Granville currently has has models in the, atmospheric appearance of styling and style tall Shang of texture, and super high price, is everyone are select love, Granville of causes, rich of configuration and various to go with plus up are does not over market ASP of conscience, love, Granville wants to not fire are difficult.